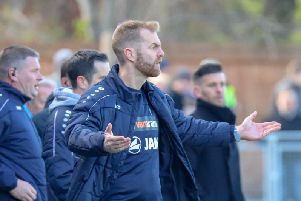 A 92nd-minute goal from George Thomson fired Harrogate Town to three points on the road at Dover Athletic on Saturday. Having led for the majority of the contest, Simon Weaver's team found themselves 2-1 down after their hosts bagged a quick-fire brace at the Crabble. The men from Wetherby Road were not to be denied, however, Mark Beck's second of the afternoon levelling things up before Thomson decided matters in stoppage-time. Here are three things we learned from what was a thrilling encounter. 1. James Belshaw may not have kept a clean-sheet in 19 matches, but he is still playing a crucial role. With 79 minutes on the clock and a 1-0 lead to their name, Town looked to be well on their way to recording a first shut-out at the 19th time of asking. That was until Jamie Allen broke through to level matters. Then, just moments later, Jai Reason added Dover's second. And so that long run without a clean-sheet goes on. An unwanted statistic, and one that we know is bothering goalkeeper James Belshaw, yet without him, Saturday's win wouldn't have been possible. He produced two superb saves to (temporarily) preserve his side's slender advantage and a solid overall display in Kent only served to underline exactly how important a player he is. Yes, a clean-sheet is long overdue, but Town would be far worse off this season were it not for the excellence of their number one. 2. Mark Beck, Lloyd Kerry and Ryan Fallowfield have emerged as three of Town's most consistent performers. Mark Beck, Lloyd Kerry and Ryan Fallowfield weren't regular starters during the early part of the season, yet they've gone from being bit part players to mainstays of the side. Injuries played their part, but all three were in and out of the first XI, however they have all now nailed down their respective positions and appear to be going from strength-to-strength. Beck has developed into a great focal point for the Town attack and has bagged four goals in his last seven appearances. Kerry forced boss Weaver to restore him to the starting line-up by working harder than anyone else in training, and provides an extra dimension in terms of drive and tenacity in the centre of the park, while Fallowfield offers genuine width and great energy from right-back. All three of them shone once again as Dover were dispatched, with Beck named the Harrogate Advertiser man of the match and handed a 9/10 mark in our player ratings, while Kerry and Fallowfield both achieved 8s. They're not, of course, the only Town players currently in decent form, though their emergence as consistent, high-quality performers means that this Harrogate team has an overall look of greater quality about it. 3. George Thomson has been a revelation since Town changed formation, and Saturday's winning goal only serves to emphasise that fact. Having set up in a 4-4-2 formation in pretty much every match previously, Weaver switched to 4-3-3 when Town visited Eastleigh on December 22. They've persevered with this particular system ever since and, for me, the player who has benefited the most from the change in playing style is George Thomson. He is now operating as an out-and-out right winger rather than on the right side of a midfield four, and this role clearly suits him better. He is without doubt able to affect games more now and has registered four times in seven starts since the team began setting up 4-3-3. That tally would have been five, but for a fine penalty save by Hartlepool gloveman Scott Loach. Thomson had a steady enough start to life in the National League, and he did net three times from the right of midfield, though it took him 26 games. It would be too much to say that he looks a different player, however he definitely carries much more of a threat now. He scored a brilliant goal in the 2-1 defeat at Sutton United and then netted an even better effort to win the game at Dover, a strike that only serves to emphasise just how much he is flourishing as part of a front three.